When you shop at the Just Hungry affiliate stores, you help to support the site while getting stuff you want at no extra cost to you! It's a win-win situation! I own, have used, or have eaten, every item that I review individually. When it comes to kitchen equipment, most of the things you see listed are items that I use all the time in my kitchen and can recommend wholeheartedly. Occasionally I will list an item that's not exactly the same as the one I own, but is very similar. I've been a satisfied customer of all the stores listed here. On the rare occasion that I've had a problem, I've always gotten good service. The Amazon.com aStore: Kitchen equipment, books, DVDs and more from the main U.S. Amazon store. The Amazon.co.jp Instant Store (same as astore, different name). Here are my recommendations for food-oriented Japanese books, magazines and DVDs. They do ship internationally! New! The Amazon.co.uk aStore, for UK and Europe based readers. On the books page I've stuck to listing great books that are published in the UK but not yet in the US or Canada. The kitchen wares page is for UK readers only. JList.com - "Your Friend in Japan" is a great source for cute and weird Japanese snacks as well as bento supplies and such. They ship internationally, of course! They do sell some 'adult' oriented stuff too, though it's easy to avoid that if you want to, and there is an age check in place. As of April 2008, we are very happy to welcome Japan Centre in London as a premium sponsor of Just Hungry and Just Bento. Japan Centre has one of the best online grocery shopping websites out there - well organized with clear descriptions. I've been a satisfied customer for a long time, way before they became sponsors. If you are in the UK or Europe and are looking for Japanese ingredients, be sure to give them a try! Here's their delivery area for food items. 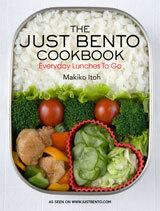 They deliver non-food items worldwide, including bento items from Daiso. YesAsia, based in Hong Kong, is a great source for people looking for a single book, DVD, CD and so on in several East Asian languages, including Japanese of course. Confiserie Sprüngli is a Zürich institution. I'm a huge fan of their chocolates and other goodies, as as I've written about before. I prefer them over the better known (outside of Switzerland anyway) rival in town whose name starts with a T. And yes, they do ship worldwide! If you live in Switzerland, click here. Looking for Japanese food or kitchen supplies? Try the Worldwide Japanese grocery (and supply) store list! Should you shop for your Japanese books and other media at Amazon, J-List, YesAsia or somewhere else? See my article about shopping for Japanese language media online.